Did you know there are both male and female pine cones? Apparently the male cones are smaller and only live a few weeks. The female cones live for several years and is further proof that we would outlive most men if there was ever a zombie apocalypse. I had a bag of pine cones sitting around and just had an urge to dress them up a bit. I mean every one deserves a makeover now and then, right? First, I spray painted them. I went with the colors of my fall mantle that I shared here. Then with a small paint brush I painted the edges of the cone scales. What fall crafts are you working on? These are really beautiful! I think I'll go some in purple! I would also LOVE to link to these if you didn't mind. These are really sweet. I painted some pinecones too this fall but I only did the tips on one side. Maybe next year I'll paint some more. 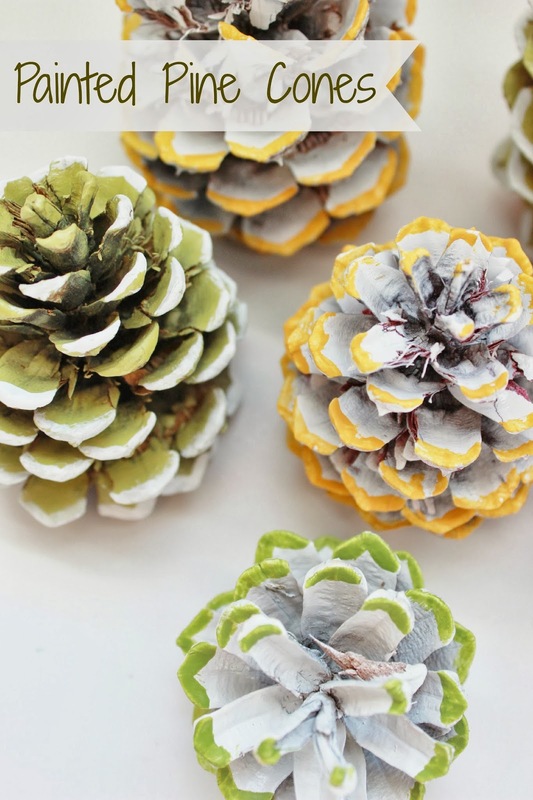 Saw these on Instagram and couldn't believe you were painting the tips of pinecones! So pretty! i saw this on instagram and thought they were so cute! what a fun idea! also, i thought we were following you this whole time...we definitely are now. oops! I love simple easy DIYs and this one is all those things, plus adorable! Thanks for sharing with us. What a cute idea to paint these! And you could customize them for Christmas too! Very cute!